Godot has nodes to draw sprites, polygons, particles, and all sorts of stuff. For most cases, this is enough; but not always. Before crying in fear, angst, and rage because a node to draw that specific something does not exist... it would be good to know that it is possible to easily make any 2D node (be it Control or Node2D based) draw custom commands. It is really easy to do it, too. Drawing shapes or logic that is not handled by nodes (example: making a node that draws a circle, an image with trails, a special kind of animated polygon, etc). Visualizations that are not that compatible with nodes: (example: a tetris board). The tetris example uses a custom draw function to draw the blocks. Drawing a large number of simple objects. Custom drawing avoids the overhead of using nodes which makes it less memory intensive and potentially faster. Making a custom UI control. There are plenty of controls available, but it's easy to run into the need to make a new, custom one. Add a script to any CanvasItem derived node, like Control or Node2D. 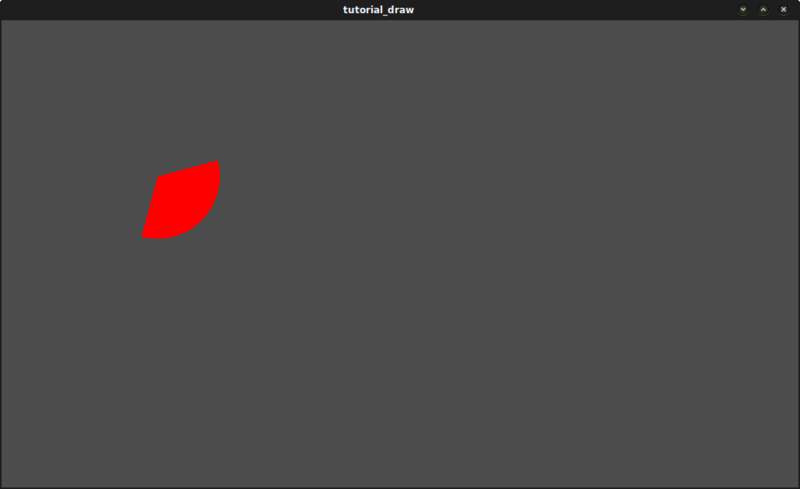 Then override the _draw() function. Draw commands are described in the CanvasItem class reference. There are plenty of them. The _draw() function is only called once, and then the draw commands are cached and remembered, so further calls are unnecessary. If re-drawing is required because a state or something else changed, simply call CanvasItem.update() in that same node and a new _draw() call will happen. # this callback is called. We will now use the custom drawing functionality of the Godot Engine to draw something that Godot doesn't provide functions for. As an example, Godot provides a draw_circle() function that draws a whole circle. However, what about drawing a portion of a circle? You will have to code a function to perform this and draw it yourself. An arc is defined by its support circle parameters, that is, the center position and the radius. The arc itself is then defined by the angle it starts from and the angle at which it stops. These are the 4 arguments that we have to provide to our drawing function. We'll also provide the color value, so we can draw the arc in different colors if we wish. Basically, drawing a shape on the screen requires it to be decomposed into a certain number of points linked from one to the next. As you can imagine, the more points your shape is made of, the smoother it will appear, but the heavier it will also be in terms of processing cost. In general, if your shape is huge (or in 3D, close to the camera), it will require more points to be drawn without it being angular-looking. On the contrary, if your shape is small (or in 3D, far from the camera), you may decrease its number of points to save processing costs; this is known as Level of Detail (LoD). In our example, we will simply use a fixed number of points, no matter the radius. Remember the number of points our shape has to be decomposed into? We fixed this number in the nb_points variable to a value of 32. Then, we initialize an empty PoolVector2Array, which is simply an array of Vector2s. The next step consists of computing the actual positions of these 32 points that compose an arc. This is done in the first for-loop: we iterate over the number of points for which we want to compute the positions, plus one to include the last point. We first determine the angle of each point, between the starting and ending angles. The reason why each angle is decreased by 90° is that we will compute 2D positions out of each angle using trigonometry (you know, cosine and sine stuff...). However, to be simple, cos() and sin() use radians, not degrees. The angle of 0° (0 radian) starts at 3 o'clock, although we want to start counting at 12 o'clock. So we decrease each angle by 90° in order to start counting from 12 o'clock. The actual position of a point located on a circle at angle angle (in radians) is given by Vector2(cos(angle), sin(angle)). Since cos() and sin() return values between -1 and 1, the position is located on a circle of radius 1. To have this position on our support circle, which has a radius of radius, we simply need to multiply the position by radius. Finally, we need to position our support circle at the center position, which is performed by adding it to our Vector2 value. Finally, we insert the point in the PoolVector2Array which was previously defined. Now, we need to actually draw our points. As you can imagine, we will not simply draw our 32 points: we need to draw everything that is between each of them. We could have computed every point ourselves using the previous method, and drew it one by one. But this is too complicated and inefficient (except if explicitly needed), so we simply draw lines between each pair of points. Unless the radius of our support circle is big, the length of each line between a pair of points will never be long enough to see them. If that were to happen, we would simply need to increase the number of points. All right, we are now able to draw custom stuff on the screen. However, it is static; let's make this shape turn around the center. The solution to do this is simply to change the angle_from and angle_to values over time. For our example, we will simply increment them by 50. This increment value has to remain constant or else the rotation speed will change accordingly. First, we have to make both angle_from and angle_to variables global at the top of our script. Also note that you can store them in other nodes and access them using get_node(). We make these values change in the _process(delta) function. We also increment our angle_from and angle_to values here. However, we must not forget to wrap() the resulting values between 0 and 360°! That is, if the angle is 361°, then it is actually 1°. If you don't wrap these values, the script will work correctly, but the angle values will grow bigger and bigger over time until they reach the maximum integer value Godot can manage (2^31 - 1). When this happens, Godot may crash or produce unexpected behavior. Finally, we must not forget to call the update() function, which automatically calls _draw(). This way, you can control when you want to refresh the frame. # We only wrap angles when both of them are bigger than 360. // We only wrap angles when both of them are bigger than 360. Let's run! It works, but the arc is rotating insanely fast! What's wrong? The reason is that your GPU is actually displaying the frames as fast as it can. We need to "normalize" the drawing by this speed; to achieve that, we have to make use of the delta parameter of the _process() function. delta contains the time elapsed between the two last rendered frames. It is generally small (about 0.0003 seconds, but this depends on your hardware), so using delta to control your drawing ensures that your program runs at the same speed on everybody's hardware. In our case, we simply need to multiply our rotation_angle variable by delta in the _process() function. This way, our 2 angles will be increased by a much smaller value, which directly depends on the rendering speed. Let's run again! This time, the rotation displays fine! Drawing your own nodes might also be desired while running them in the editor to use as a preview or visualization of some feature or behavior. Remember to use the "tool" keyword at the top of the script (check the GDScript 기초 reference if you forgot what this does).